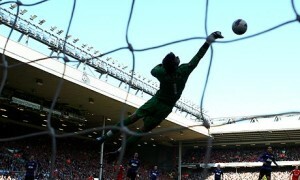 Manchester United’s number one goal keeper David De Gea has been criticized often in his two years at Old Trafford. This is why I think they need to keep him. In the past 6 matches David De Gea has allowed 4 goals and managed to keep 2 clean sheets. His performance against Real Madrid in the Champions League was world class. The only goal he allowed was a towering, fantastic header from the second best player in the world. De Gea has had his critics ever since joining Manchester United in the summer of 2011. I will admit that he has struggled with handling crosses, commanding his box, and needs some work on communication, however, I think his critics have been far too harsh. 1) David De Gea is already one of the premier shot stoppers in the game. His display against Real Madrid only solidifies this fact. He could be the difference in United’s Champions League run considering the difference in play styles between Continental football and English football. In the EPL this season he has 68 saves in 18 games (3.8 saves per game), along with 5 clean sheets. In the Champions League he has 18 saves in 6 matches, averaging 3 saves per game. The more he is able to play, the better he is going to become. 2) Sir Alex Ferguson’s ability to develop young players. Manchester United has long been known for their development of young players going back as far as Sir Matt Busby and his “Busby Babes.” Sir Alex has stepped up to take on this role and his ability to help young players further develop has been a key to United’s continued success. It is true that not every player is able to advance, but looking at the current team it is clear that he knows what he is doing when it comes to building a team. Players like Paul Scholes and Ryan Giggs came through the youth system along with younger players like Danny Welbeck and Tom Cleverly. Ferguson was also able to develop one of the best players in the world in Cristiano Ronaldo. With De Gea being only 22 years old he has plenty of time to develop into a world class goal keeper. AC Milan/Italy goal keeper Gianluigi Buffon is 35 years old and at the top of his game, playing as perhaps the best keeper in the world at the moment. That is still 13 more years of development for De Gea to grow and get stronger. This is a very encouraging thing for any United supporter. 3) David De Gea is still very new to the English Premier League. This is only his second season in the Premier League. He has plenty of time to learn the game and develop and the more that he plays the better he is going to get. He needs the playing time in the league to learn the English game and lately he has been getting that. As he spends more time playing he will be able to build on his communication with other players as well as his confidence in goal. At the moment he struggles with handling the physicality of English football. He doesn’t always do well dealing with crosses and set pieces, which are a big part of the EPL, but with time he will get better at this and he is already showing progress. I think every keeper that has come into the League has had some kind of issue with this. Even top goal keepers like Petr Cech and Joe Hart have difficulties at times and certainly struggled in their first year or two. David De Gea is still a very young player and even more so when compared to when world class goalkeepers tend to peak. It would be a stupid move to let him leave Old Trafford and I think he is set to become one of the best in the world in the next couple of seasons. This is a player that simply needs to continue to get games and build on his confidence. Let me know what you think about De Gea. Perhaps you think he should be let go and an older keeper brought in? Does he have the potential to become the best in the world?